This highly figured solid Birdseye Maple dining table is finished with a hand rubbed oil and varnish finish. This extension table is shown on the left with one of two leaves. Shown below closed to seat 4. 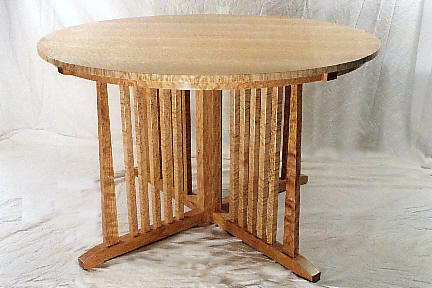 The Cherry legs with Birdseye Maple spindles have a Craftsman flair. When the couple who commissioned this piece put their house up for sale, the buyer wanted them to leave the table. 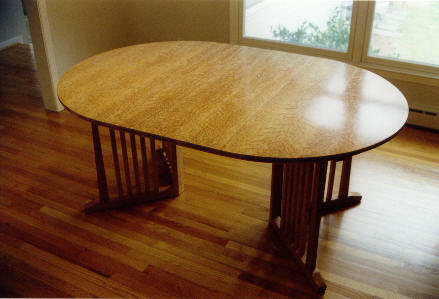 They didn't, and I built another table very much like this out of Cherry for the new owners of the house.